There are few things more rewarding in the Triangle than going to a nearby brewery for a pint, and finding one of the area’s best and creative food trucks is there to satisfy your hunger. This trend is showing up almost everywhere across the Triangle as it turns out. Recently Belle and I made a return visit to Raleigh Brewing Company to enjoy their handcrafted brews, and as fate would have it, Chef Ed Sautro and his wife Nicole of Amigosan food truck, were on-hand to provide the sustenance. We had met Chef Ed earlier last year, and became immediately enthused by his fusion skills. Taking a Mex-Asian approach, Chef Ed provides the diner with a unique experience. 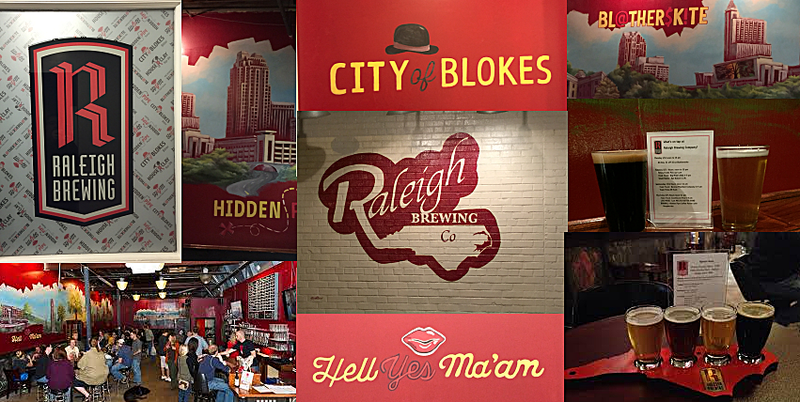 Raleigh Brewing Company is located at 3709 Neil Street, Raleigh, NC. There artisans, called brew masters, labor to create such masterpieces as: Bl@ther$k!tea – Scottish Ale, City of Blokes – a bitter ale, Hell Yes Ma’am – a Belgian style golden, Hidden Pipe – a hearty Porter, House of Clay – a Rye IPA, Moravian Rhapsody – a Czech styled Pilsner and, my favorite, Oak City Coffee Ale – a coffee infused ale. We began our night with primers: for Belle a Moravian Rhapsody, a crisp, hoppy and refreshing Pilsner brewed with traditional Pilsner malt, Saaz hops, and German Lager yeast. For myself, an Oak City Coffee Ale, whose flavor is simultaneously sophisticated and sassy. ‘Priming,’ I should explain, is properly preparing the palate and exciting the stomach for what is to come. A good handcrafted brew is an excellent primer, and can complement the meal as well. Belle and I arrived via Uber a little before 6 pm, which gave us a few minutes to talk with Ed before he had to set-up for the evening’s hungry patrons. “I’ll let the food speak for itself,” he explained with an air of confidence, as he turned his attention to the task of prep work. I had no doubt Belle and I would later be impressed. After finishing our first round, I went out to place our orders, only to find a crowd had already gathered around Amigosan. I knew that this was an encouraging sign. Amigosan – Shredded Kale, Napa and red cabbage slaw, tossed in sesame soy dressing, finished with Cojita cheese and sweet and spicy aioli. Taj Mahal – Curried fresh spinach, cucumber and carrots, spiced chickpeas with Masalia Curry aioli. Sombrero – Shredded Romaine, tossed with southwest Caesar dressing, Mexican corn relish, Jack and Colby cheese, topped with Chipotle lime cream. Thai Thai Again – Napa/Red Cabbage blended with peanut sauce, carrots, toasted coconut, finished with Sriracha Crema. 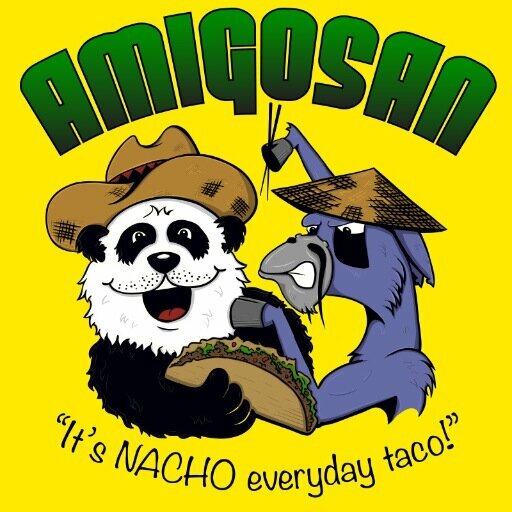 Belle and I selected; Amigoasn with steak, Thai Thai Again with Chicken, Loaded Tater tots, Amigosan style and Loaded Nachos styled Thai Thai Again, with steak. One of the most delightful things about the food is its presentation, ‘a feast-for-the-eyes’. Wonderful colors and arrangements make each entrée visually appealing. Next is the way it tantalizes the palate with a crunchy texture and a burst of dressing flavor in each bite, none overpowering the other. As we were finishing, Ed appeared at our table with a sampling of his nightly special. Just when I thought we had gotten away with a nearly perfect sampling of Amigosan, Chef Ed raised the bar – Shrimp so delicate, highlighted with Napa cabbage, carrots, cucumber with rice wine vinegar, wasabi aioli and black sesame seed. Now the evening had reached its gastronomic summit! 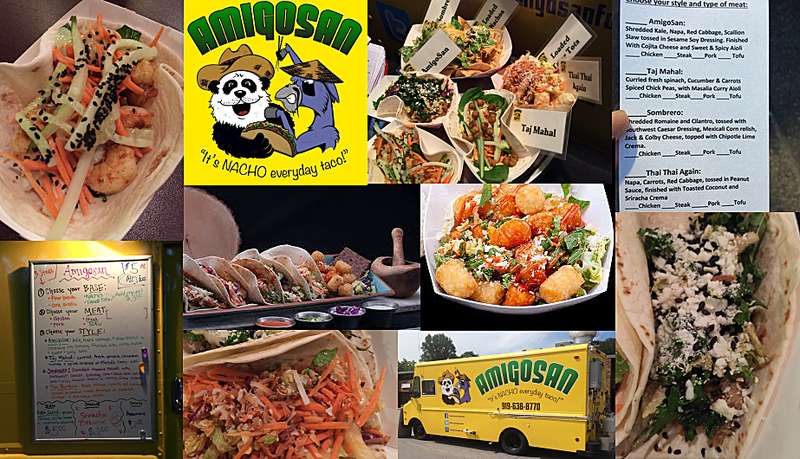 I highly recommend you try Amigosan’s food truck some time soon. You won’t be disappointed. Belle and I have found going to a local brewery where a food truck is on site with windows up a great way to end the workweek and start the weekend. 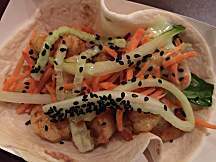 No fuss, no frills – a great casual outing with good food and brews.